Fall 2015 is shaping up to be wonderful. Brilliant sunshine. And cool enough temperatures to turn my fall fashion inspiration into reality. And now I’m not just dreaming about the outfits… I’m wearing them. Remember this shot from Vince.com? Well, it prompted me to unpack my most prized fall acquisition, which has been “seasoning” in my closet for months. Let me explain that comment… when my mum buys a new blouse or coat, and then lets it hang in her closet for a year, unworn, saying it’s “too nice,” as she is wont to do, we always joke that she’s “seasoning” it. Like aging cheese or wine, until it’s ready to eat or drink. Well, my Vince coat sweater has “seasoned” enough, and it’s ready to come out of the closet. Or the drawer in this case. The great thing is that I actually like my sweater even better than the “inspiration” one the model is wearing above. 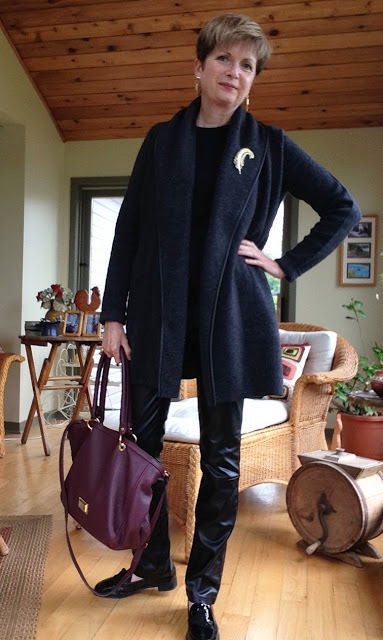 I’m wearing it here with my stalwart leather pants from two years ago, a black long-sleeved tee from Gap, and my Stuart Weitzman patent loafers with tassels. I love these shoes. 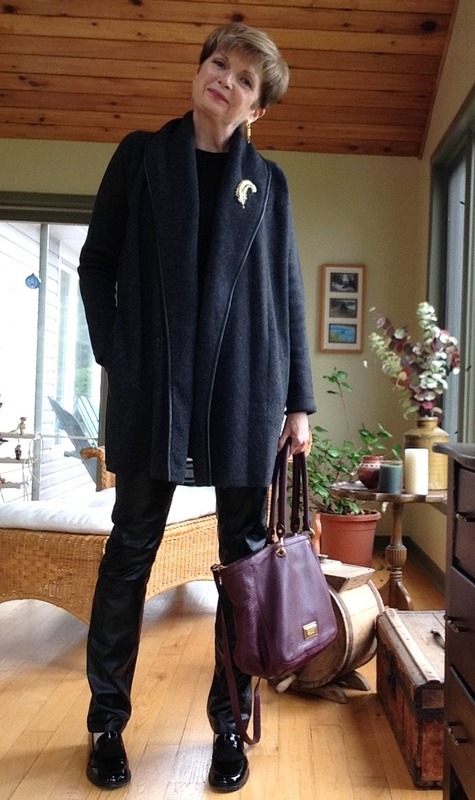 Like my sweater, I bought the burgundy Marc Jacobs bag at the Nordstrom Anniversary sale in July. So it’s well seasoned too. The feather brooch is my mum’s, from the sixties. I love that brooches are big again. The gold brooch and earrings brighten up the black and grey palette, don’t you think? This is a perfect shopping, or lunch with friends, outfit. And then, mixing the cool grey & black with the warm gold inspired me to try my new brown Paul Green boots with my grey sweater. Turns out that I love grey with brown. And I was excited to see that these grey, Judith and Charles, cropped knit pants from several years ago are just the right shade to go with my new sweater. And they look great with my new booties. Uggh. As of now, I’m going to stop calling low boots “booties” … just typing that feels embarrassing. Booties are for babies, okay? Okay. So the boots and the cropped grey pants definitely dress-up the original outfit. More appropriate for a lunch that is a bit of an occasion…. like later this month, when our “To Hell With the Bell” group of retired teachers meets at a local restaurant. Talk about a task getting these ladies organized! Between trips to Spain, England, France, Egypt, art exhibits, volunteering, you name it… they are a busy bunch. So now that we finally have a date for the lunch, I might wear this outfit. 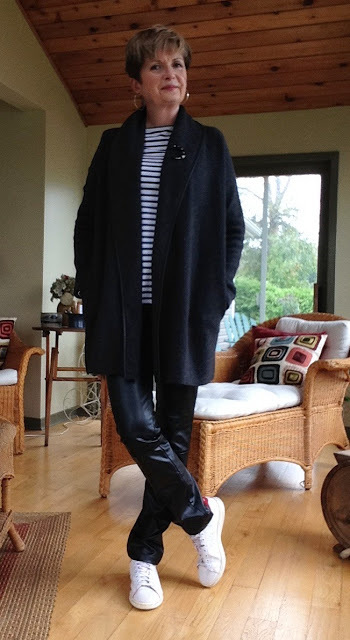 My Paul Green boots, grey J&C cropped pants, a cream Elie Tahari ruffled blouse…. and of course, my Vince coat sweater. Which is fast becoming the “completer piece” of the fall season for me. Remember when Stacey and Clinton, of What Not To Wear, used to tell their make-over subjects that they always needed a completer piece to pull an outfit together? Well, I’m a completer piece girl from way back in the seventies. I never went anywhere without a sweater or jacket. You know, I think I like this outfit. 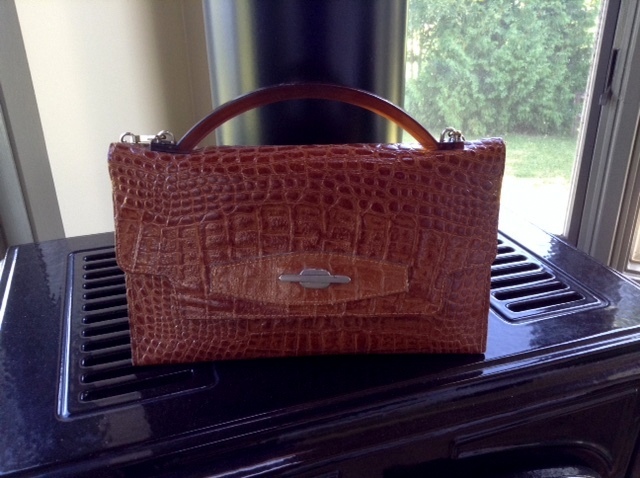 And to make it a bit more lady-like I pinned a vintage brooch at my neck, and grabbed this vintage croc bag. 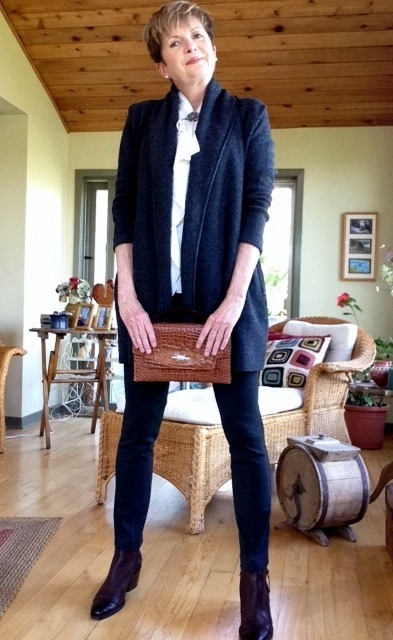 I bought the bag at the “Ottawa Vintage Clothing Show” a couple of years ago. It’s sweet, isn’t it? I love it. Likewise the brooch. When I was researching my inspiration post last week, I came across this photo of Tibi founder Amy Smilovic on Matchesfashion.com. I’d never even heard of Tibi. And so I was sidetracked into reading this interview with Smilovic on the Matchesfashion.com website, and this one in the The Telegraph. I like her fashion philosophy of “simple basics in luxurious fabrics,” and so I checked out the Tibi fall collection on their website. Lots of knit wear and full skirts and pants. The clothes are cosy and luxurious. 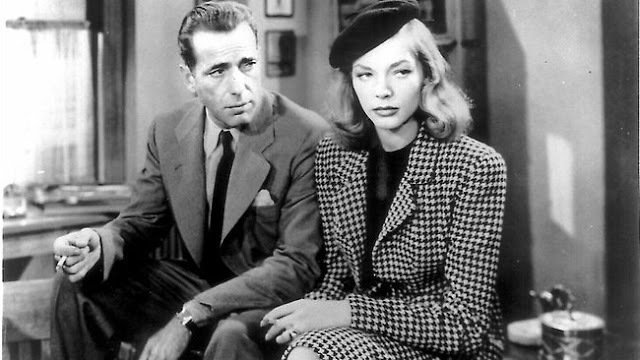 And somewhat louche, if I can say that, in the sense that the looks are undone and maybe a bit rakish. I thought they were wonderful. Even if they’re not exactly something I could pull off. And I also loved Smilovic’s outfit pictured above. Grey heathered knit vest, with black and white sweater, black leather pants and sneakers. Hmm. I could have a go at that look. Sort of. Or at least my interpretation of it. So I tried my leather pants and Vince coat sweater with my ALC striped tee shirt and my sneakers. Dressing my original combination down instead of up, so to speak. I feel great in this look. A cosy fall run-around outfit. This year…Vince completes me. At least wardrobe-wise. Yep. Sigh. You might say that if you were a dreamer, and a silly romantic, and someone who is given to hyperbole. And, of course, I am. All three of those things. Now I have to go and decide what to pack for our mini-holiday. Due to Hubby’s shoulder surgery, and the fact that he is unable to use his right arm, we’ve had to forgo our favourite camping trip this year. Fall camping is the best. We will miss the crisp nights, the camp fires, the long walks in the fall colours. But we really are in need of some time away. So we’ve booked a cabin on a lake near Algonquin Park for a couple of nights instead. Now… I’ll need jeans, my hiking boots, my fleece sweatshirt, and my Gortex jacket. I guess this is the one outfit that Vince won’t be completing this fall. And stay tuned for Fall Rotation 2.0 …. Tweed. Hopefully. Have you found that one piece that completes you this fall? Or at least completes your outfits? My new socks are making me happy to get dressed again this winter. PrevPrevious storySometimes You Just Really, Really Need A Good Laugh. I've still got three more weeks of living out of my carry-on, 7 weeks total, and as the weather begins to turn a bit cooler here, I have been remembering some of the sweaters and boots waiting for me at home and trying not to get too tempted by gorgeous displays of fall clothes in the wardrobe here. Your outfits are all very polished, albeit casual and comfortable, looking forward to seeing your twee. Meanwhile, Happy Hiking! Just think how glad you'll be to see your sweaters and boots. There's something to be said for living out a suitcase for an extended length of time. I'm always so glad to see my closet full of clothes! But maybe you'll be forced to buy one lovely French cashmere sweater??? Just the one? I can see where your mum is coming from , when you love something new you can want it to stay pristine & perfect for a while . I'm a bit like that but I couldn't manage it for a year ! Vince is making you some very stylish outfits & I love the little vintage bag . I have one similar in navy croc but yours is in far better condition . Have a lovely break, you deserve it after the last few weeks . I'm off to Barcelona with my sisters tomorrow to get 'Gaudied out' – after a couple of days of the crowds I might wish I was in your cabin by the lake . All of your outfits are wonderful and you really scored with Vince. 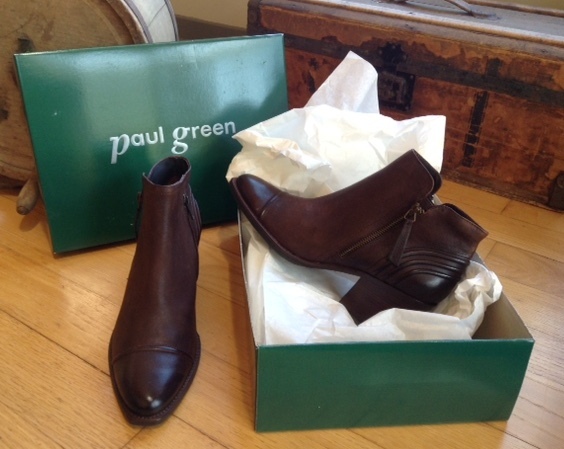 I tried on those Paul Green boots and have never had any fit my fussy feet as well as they did. I was concerned they looked a little western/cowgirl so I haven't purchased them yet. They don't look that way at all in your outfit so I'm going back to get them. Thanks for all the inspiration and enjoy your get away. Thanks very much. I did find the heels of my boots a bit cowboy at first, but when I tried them on with my skinny jeans I changed my mind. And they look great with flares as well. Shoots (as in SHort bOOTS)? 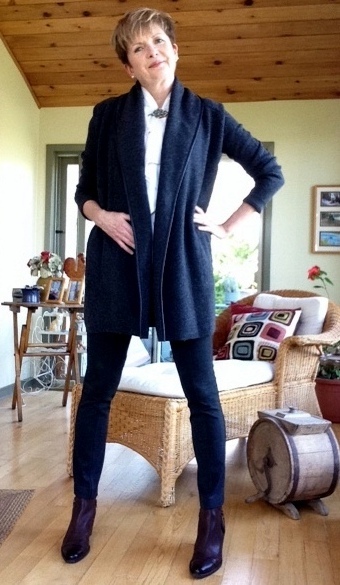 Lovely…How did you find the sizing to run on this cardigan? I originally bought the medium and returned it for the small, which is much better. Even the sleeve length is perfect. I'm usually a size 10 on top, and I have broad shoulders, and long arms, so the sweater is definitely made big. Thanks…I had a feeling we were about the same size. Vince can be tricky if you are purchasing on-line (living life in the slow lane in Vermont). Loots and/or shoots. Love both monikers. Hi Sue, a cabin on a lake sounds perfect for an Autumn break. I hope you have a great time with dry and sunny weather! 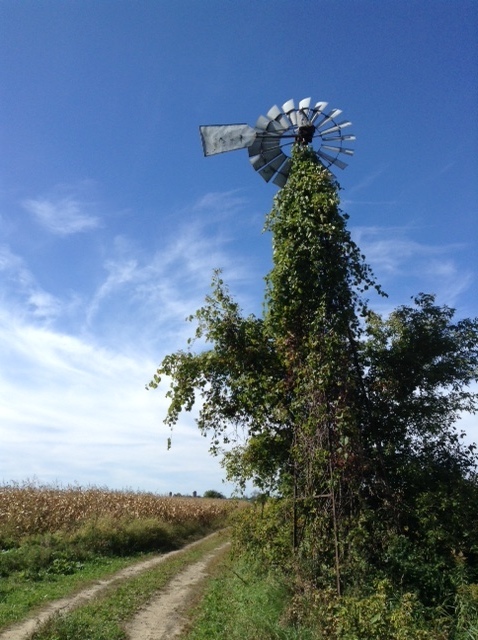 We're having beautiful weather at the moment … warm and sunny enough for just a t shirt!! Better than some of our summer days this year. All your outfits look good but I especially like your Vince jacket …. lovely and cosy as well as smart and the burgundy and vintage bags. Thanks, Rosie. The weather is supposed to be beautiful…but we're packing our rain gear just in case. I've been doing the tightlining on the underside of my lashes only for days when I just want a really natural look….errand running etc. I like the look. Glad it's working for you too. Wholly agree with the silliness of "bootie." Some manufacturers and retailers say "ankle boot," which makes sense given we already use the term "knee boot." 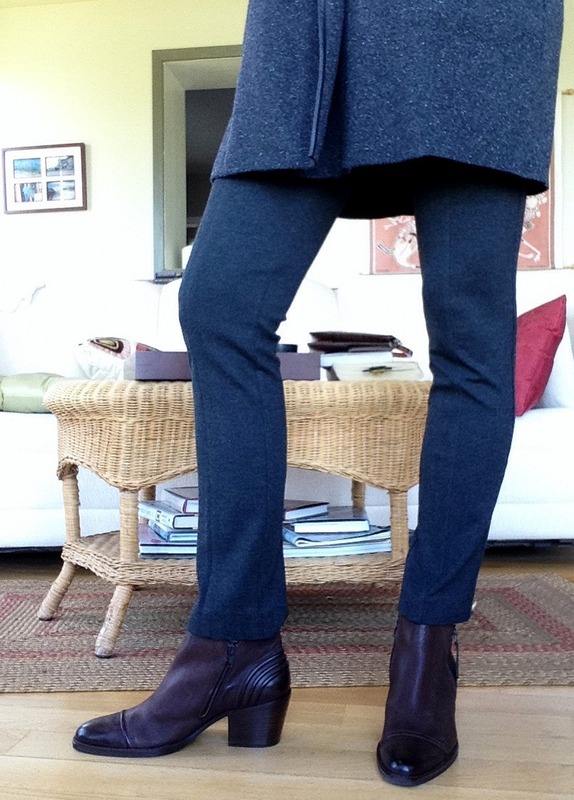 Ankle boot…that's the grown-up term I've been searching for…thanks! Is there a period in the brand name??? I've never noticed. May have to hand in my English teacher qualifications after this. And it does look wrong (and sound wrong) in a sentence doesn't it? Especially if you read the sentence the way it's punctuated. Sue! I am in the market to buy some dark brown riding style boots. Low ones that go above the ankle-low shin. Kinda like the lace up style you see in Anne of Green Gables. What your take on that style? It is a little hipster, but I feel they can be worn with skinny jeans or flares. A step up from my crocs though, haha! Spot any nice ones lately? Hey you!! How's life at home with the babies? Can't say that I've seen any boots like you describe. But I am… as always… up for a shopping trip anytime you're ready. Wow! A great post. I love all the variations you went through. I may have to buy some leather pants. What's your take on faux vs. real for comfort and look? Love that little crochet bag, too. This was a great way to show the versatility of several wardrobe items. My leather pants are not real leather. The fabric is very light and kind of soft, like felt, on the inside, so they don't cling or bind at all. They're very comfortable. What a perfectly delightful October read. We're still rocking the 80 degree temps here in Oregon so my fall loots/shoots and sweaters will have to "season" a bit longer. And please, who wouldn't be intrigued and smiling at a To Hell with the Bell group of retired teachers? Thanks Barbara. We thought that was a good name…who says teachers are boring, eh? Sorry you've missed your camping trip but a cabin by a lake sounds so idyllic. Love these leather pants, I've been searching for some myself. Have a great trip! Thanks, Lorna Mai. Good luck finding the perfect leather pants. This is great! Love all the vintage pieces! I'm new to your blog and am glad I found you! I like the way you are showing a dressed up and dressed down look today, just by changing the blouse and shoes. Thanks, Lynn. Welcome. Thanks for reading….hope you come back often. Great style and great looks!! Let's go shopping! 😉. Thanks Dawn Lucy. That means a lot coming from a fellow English teacher! I miss WNTW too. You're right; Stacey's new show is just not up to the same standard.